Myra Engrum stands by the huge pile of her and her son's belongings, plus all the wet building materials that have been pulled out of her flooded house. 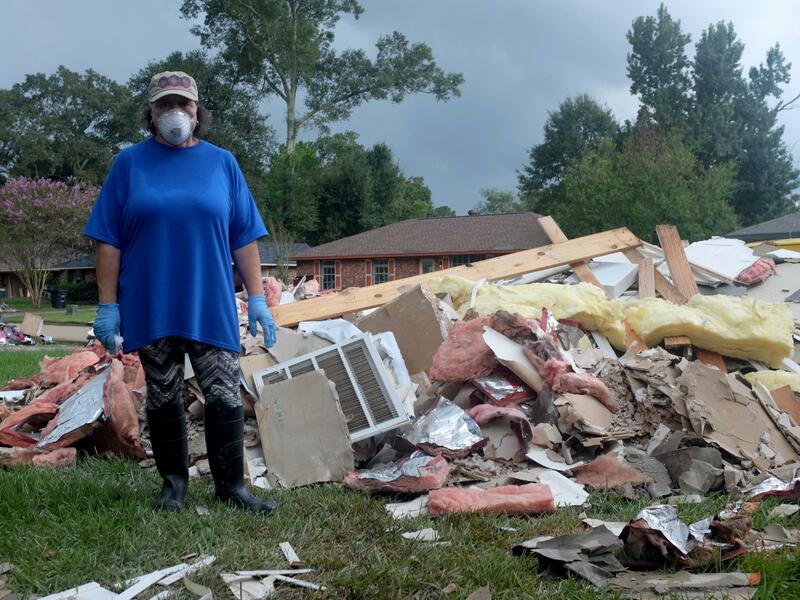 Myra Engrum puts on a face mask and tall rubber boots each time she enters her house. The brick ranch home got more than four feet of floodwater. 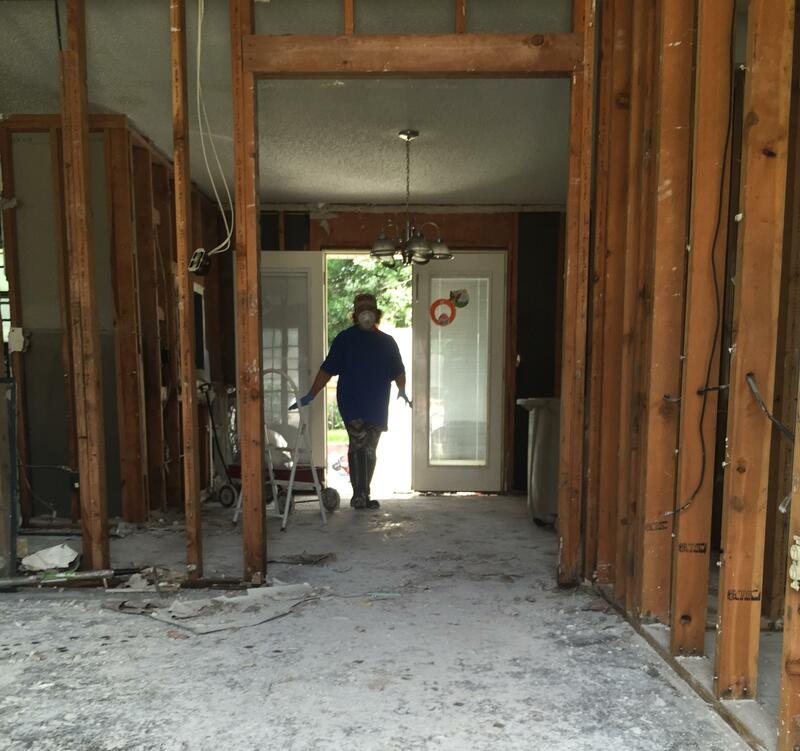 Her contractor, with help from volunteers from her church, already has stripped the walls down to the studs. "It was wonderful to feel like I'd never have to be homeless again." Myra Engrum is sitting in a McDonald's in Louisiana, steeling herself for another day of mucking out her flooded home. The parking lot is full of construction trucks and cars with a insurance company logos. A lot of meetings are happening here. "I had over four and a half feet of water in my home, on the inside and outside," she says. "This is my first home that I ever purchased. I got the home right after Katrina." Engrum, like many of those who lost everything in the recent floods around Baton Rouge, La., is a veteran of disaster. She lost everything when Hurricane Katrina hit New Orleans 11 years ago, and like thousands of others moved north to rebuild her life, bringing along her pregnant daughter. Her daughter died soon after childbirth, and Myra Engrum became the baby's mother. Jeremiah is now ten; she's 61. The two of them were in their small brick ranch house earlier this month when the flood came. "I call him my hero," she says, "because that Saturday, it was not raining. We were in the living room; he looked through the mail slot and said, 'Mommy there's water in the street.' "
They drove out, just in time. That night, around midnight, Engrum sat in her car with her son in the dark, and something clicked. Her disaster experience from a decade ago kicked into gear. "All of a sudden I said 'Jeremiah, do you have a tablet? '" Engrum says. " 'I need a tablet to write on, I've gotta make some notes.' "
Her son pulled a notebook from his backpack. Now it's on the McDonald's table, full of lists, phone numbers, names of FEMA reps and insurance agents. "Because of my experience with Katrina, I knew that people were gonna be asking things like 'What did you lose in the house?' " Engrum says. Eventually she's ready to face the day, She heads out to her house on Acacia Street to meet her contractor, who says he's going to spend the day gutting her kitchen. Engrum had taken the precaution of buying flood insurance, but it only pays for home repairs. She couldn't afford the more expensive policy to cover contents — the kitchen appliances that are now piled in a mountain out front, for instance. The list of things Engrum may have to pay for out of pocket is endless: "Everything I owned — pots and pans, cabinets, you name it, mattresses, Jeremiah's camping stuff, his Boy Scouts uniform." Engrum won't let Jeremiah see the house — health officials want kids to stay away from moldy homes and slippery debris, and she worries it would be traumatic for him.For now, they're staying with one of Jeremiah's former teachers, an hour's drive away. Each day Engrum makes the trip to Baton Rouge to drop her son at day camp, while she deals with house stuff. Today, she stops in to check on him. It's hard to tell if he understands the extent of what's been lost. He lists off the library books he had checked out when the water rose, and Engrum tells him they're gone. He says he hopes they'll be understanding about not getting them back. As he runs off to return to day camp it starts to rain. Standing beneath the concrete overhang, Engrum starts to sing an old spiritual, "Nobody Knows The Trouble I've Seen." It feels like a momentary break from the huge tasks ahead — finding work and a place to live, providing a stable life for Jeremiah. She's starting all over again. She's done it before, but that doesn't make it any easier. 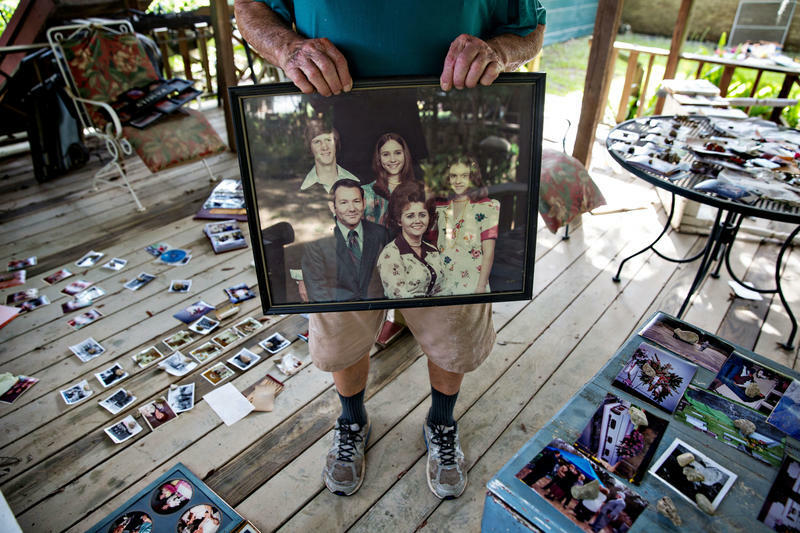 Many people who lost everything in the recent floods in Louisiana are veterans of disaster. After Hurricane Katrina hit New Orleans 11 years ago, thousands of the city's residents moved to Baton Rouge to try to rebuild their lives.  Eve Troeh of member station WWNO in New Orleans met one woman who has to start over yet again. EVE TROEH, BYLINE: Myra Engrum isn't ready to start another day mucking out her flooded home - not just yet. And there's no place to sit. So we go to McDonald's. The parking lot's full of cars with insurance company logos, lots of construction trucks, too. A lot of meetings are happening here. Inside, Engrum spreads out her paperwork. Her curly, dark hair peeks out from under a khaki baseball cap. She reapplies pink lipstick - a sort of armor of civility against the chaos. MYRA ENGRUM: I had over four and a half feet of water in my home. And this is my first home that I've ever purchased. I got the home right after Katrina. TROEH: She lost everything after that storm. She moved here to start a new life. ENGRUM: It was wonderful to just feel like I would never have to be homeless again. That was my big deal. We're going to get a home, so we're not homeless again. TROEH: We was Engrum and her pregnant daughter. Her daughter died soon after childbirth. Myra Engrum became the baby's mother. Jeremiah is now 10. She's 61. The two of them were in their small, brick ranch house when the flood came. ENGRUM: And I call him my hero. We were in the living room, and he peeked through a mail slot. And he said, Mommy, there's water in the street. TROEH: They drove out just in time. That night, around midnight, Engrum sat in her car with her son in the dark. And something clicked. Her disaster experience from a decade ago kicked into gear. ENGRUM: All of a sudden, I said, Jeremiah, do you have a tablet? I need a tablet to write on. I've got to make some notes. TROEH: Her son pulled a notebook from his backpack. Now it's on the McDonald's table, full of lists, phone numbers, names of FEMA reps and insurance agents. ENGRUM: From my experience with Katrina, I knew that people are going to be asking things, like, you know, what did you lose in the house? I wonder if the rain's going to affect their work today. TROEH: Dark clouds loom as she meets the contractor at her house on Acacia Street. ENGRUM: So what are we going to - what are you ready to do now? UNIDENTIFIED MAN: We're going to open the door and finish doing - I got to get your appliances out. So I got to tear that kitchen out. TROEH: Engrum had taken the precaution of buying flood insurance. But it only pays for home repairs. She couldn't afford the more expensive policy to cover contents, like furniture and appliances - the stuff that's now piled in a mountain out front. ENGRUM: That's everything I owned - pots and pans, cabinets, you name it, mattresses, Jeremiah's camping stuff, his Boy Scouts uniform. TROEH: Engrum won't let Jeremiah see the house. Health officials want kids to stay away from moldy homes and slippery debris. Plus, she worries it's traumatic. For now, they're staying with one of Jeremiah's former teachers, an hour's drive away. Each day, Engrum makes the trip to Baton Rouge to drop her son at day camp while she deals with house stuff. She stops in to check on him. TROEH: It's hard to tell if he understands the extent of what's been lost. JEREMIAH: And I have to try to return all my library books for a long time. ENGRUM: All the library books are gone. How many did we have - that you checked out? JEREMIAH: I think it was 50. ENGRUM: All the - what's the name of the one? - like, "Nate The Great." JEREMIAH: Yeah, I had "Nate The Great." I had "Arthur." I had "Star Wars," and I have, like, lots more. TROEH: I think the library will probably understand. TROEH: Engrum nudges Jeremiah back to camp. As he runs off, it starts to rain. Standing beneath the concrete overhang, seemingly out of nowhere, she starts to sing, a song from church. TROEH: It feels like a momentary break from the huge tasks ahead - finding work, a place to live, providing a stable life for Jeremiah. Myra Engrum's starting all over again. She's done it before, but that doesn't make it any easier. For NPR News, I'm Eve Troeh. Transcript provided by NPR, Copyright NPR. When 2 feet of rain fell, and the Vermillion River swelled its banks earlier this month, the mayor of Maurice, La., Wayne Theriot, got hit with a double whammy: He lost his home and his office. The two are just a couple of hundred yards apart in this small town of about 1,000 people that straddles Vermillion and Lafayette parishes in a largely rural corner of the state. "You're in City Hall — what's left of it," he says, pointing to the ruined furniture and computers in the tiny three-room building. 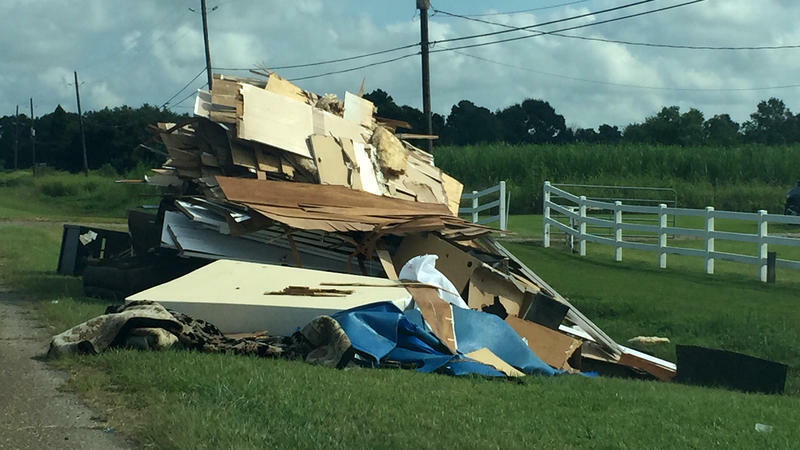 In Baton Rouge, La., people are using whatever tools they have to help their community recover from the flood. Four photographers have been creating portraits of those affected. Their project, "Humans of the Water," focuses not on what people lost, but on what they saved. One of those photographers is Collin Richie. He says documentary photography isn't typically his style. Most of his work involves snapping photos for weddings, magazines and corporate advertisements. Food writer Ian McNulty on the role that Louisiana's strong food culture can play as the state rebuilds from devastating floods. When everything is torn apart, we gravitate to what brings us together. In Louisiana for all the hardships we’ve seen on the ragged edge of that equation, we’re fortunate to be so strong on the other side. Our shared food culture is one of those anchors.